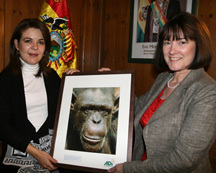 Animal Defenders International (ADI) today presented Ambassador Beatriz Souviron of Bolivia with the first Toto Award for services to animal protection and conservation of species and their environment. The award acknowledges President Morales and the Bolivian Government’s progressive stand on new legislation in Bolivia to end the use of animals in travelling circuses. After a successful passage through the Congress, the Bill has been placed before President Morales for signature, and it will then pass into law. ADI Chief Executive Jan Creamer, “Bolivia now leads South America with progressive legislation to protect animals and the environment. One of the pillars of Bolivia’s new Constitution includes these important issues, and the new circus legislation reflects this. The Bolivian Government is to be congratulated and it is hoped that other progressive nations will follow. The Bill, tabled by Congresswoman Ximena Flores of Potosi, arose as a result of evidence gathered during a disturbing undercover investigation. ADI’s field officers worked undercover in circuses across Bolivia and their observations included: Lions confined in a tiny cage on the back of a truck - the adults left the cage for just ten minutes each day to perform for the show. A lion cub remained permanently in the cage. During the show, the animals were forced to jump through a ring of fire. Two of the lionesses were pregnant, but continued to perform. Three brown bears were kept in three compartments of a beastwagon, each measuring approx 2.5 x 3m. Their only exercise was the walk to and from the ring for their short performance. The same bear act had previously been with a circus in Peru. There was no safety barrier between the audience and the three brown bears as they were made to dance, play dead and ride a bicycle. A mandrill was kept in a small wire mesh cage - approx 1.5 x 1.5m. The award presented at the Bolivian Embassy in London today features a picture of Toto, a chimpanzee rescued by ADI from traveling circus in South America and now living with a chimpanzee family in Africa. Alexandra Cardenas, Animals In Entertainment Campaigner, is available for interview. ISDN radio facilities are available at the ADI offices. NATURALIS-BOLIVIA, GAIA PACHA, EBA-BOLIVIA, ANIMALES SOS (La Paz y Santa Cruz) amongst others. With offices in London, San Francisco and Bogota, ADI campaigns to protect animals in entertainment, replacement of animals in experiments; worldwide traffic in endangered species; vegetarianism; factory farming; pollution and conservation. ADI also rescues animals in distress worldwide. Our evidence has led to campaigns and legislative action all over the world to protect them.